John Clarke / Socialist Project. On November 22, MacLeod announced the results of the review process. Generally speaking, while some voices of serious concern have been raised, the brutal nature of the Tory measures has not yet been widely appreciated. One comment on the Ontario Coalition Against Poverty (OCAP) Facebook page suggested that “Harris did far worse.” Actually, the reference to the attack on the poor that was carried by the Tory government of Mike Harris in 1995 puts things into clear focus. Harris, exploiting the fact that the Liberal and New Democratic Party (NDP) governments that preceded his regime had been happy to leave a system of social assistance in place that imposed legislated poverty, had three major objectives when it came to degrading income support in Ontario. Firstly, he wanted to drastically reduce the adequacy of social assistance rates. This he did by implementing a 21.6% cut and by freezing benefits for the next eight years. The Liberals who followed him provided increases below the rate of inflation and so, more than 20 years after Harris slashed them, benefits levels are so low that a major reduction is hardly necessary. Harris also eliminated the relatively secure and more adequate benefit system for single parent families. After 1995, they were treated as job seekers on the lowest benefit levels. This measure, along with the 21.6% cut, was highly successful in terms of the key Tory objective or forcing people to scramble for the lowest paying jobs on offer. Finally, however, the architects of the Harris measures also hoped to reconfigure the system so as to establish a regime of precise coercion when it came to driving people into the low wage sector. The tools available in the 1990s were more limited than today and Harris was not as successful as he and his co-thinkers would have hoped. His efforts to establish a system of workfare forced labour were not spectacularly rewarded and pointed to the need for an alternative approach to coercing the poor into the worst forms of employment. Harris did create an Ontario Works (OW) benefit system that included a requirement for recipients to sign a “participation agreement.” This can certainly be intrusive and punitive but there is room to develop far more refined tools that can be used to supply the most unscrupulous employers. 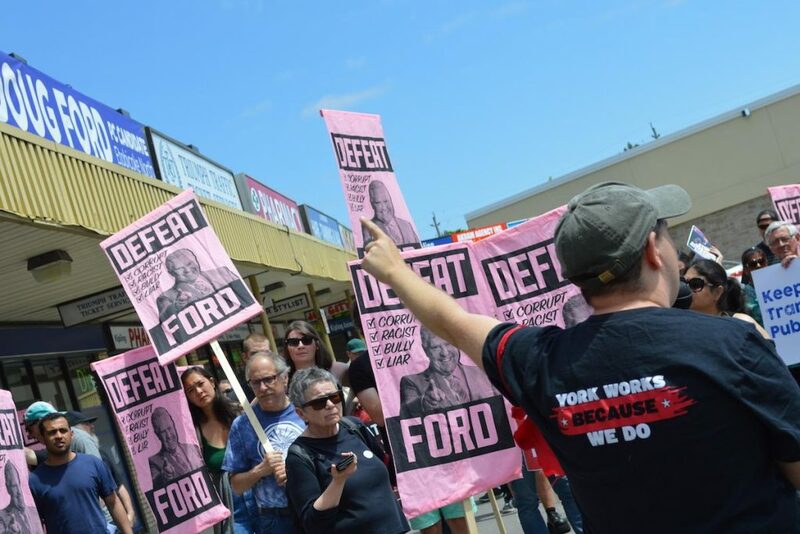 Doug Ford’s new Poor Laws are focused on opening up just such a pathway to super exploitation of the lowest paid and most vulnerable workers. MacLeod’s announcement of the results of the Tory review failed to set off enough alarm bells for several reasons. Firstly, as previously stated, the present round of Tory regression does not have to involve the driving down of benefit levels because that job has already been taken care of. Hence, the kind of shock that the deep cut Harris made in 1995 has been avoided. Secondly, many of the details of the plan have yet to be revealed as the process of implementation unfolds over the next year and a half. The backgrounder that MacLeod’s Ministry issued is hardly a voluminous document. Finally, she was careful to talk the language of “compassion” and to speak of “wrap around services” that would provide poor people with “dignity.” However, there are some important clues that enable us to discern what is really going on here. MacLeod is fond of throwing out that old right wing cliché that ‘the best social program is a job.’ With this remark, she points us to an understanding of how the Doug Ford Poor Laws relate to the basic agenda of the Tory government. They are all fond of telling us that ‘Ontario is Open for Business.’ Their whole agenda of austerity and social cutbacks speaks to just what they mean by this. Their cancellation of a planned increase in the minimum wage to $15 an hour and the revoking of a series of substantial improvements in the rights of low paid workers drives it home. Their elimination of proactive workplace inspections to detect wage theft and other abuses could not make it more clear. The Tories intend to open Ontario for business by ensuring that exploiters have an entirely free hand. In this regard, the adequacy or otherwise of the province’s income support system is a decisive question for them. Put bluntly, they are working to create a cheap labour army and their social assistance system must provide a supply of conscripts. The work of degrading income support systems has gone much further on an international scale than it had when Harris was doing his work. The cutting edge austerity measures in the UK, including the infamous work capability assessment that has been used to declare even profoundly disabled people ‘fit to work,’ have caused huge hardship and vast injustices and the rolling out of the Universal Credit system there is taking things further than ever in this regard. Taking their cue from the UK war on the poor and disabled people, the Ontario Tories are focusing on two fronts of attack. Firstly, they will redefine disability to bring it in line with federal standards. This will mean that a standard will apply that requires someone to show they have profound and long-term impairments and almost no chance of working. This would exclude many who might today be eligible for the Ontario Disability Support Program (ODSP). It is a horribly regressive move that will mean that peoples’ disabilities will be disregarded on a huge scale. The Tories say that those presently on ODSP will be ‘grandparented’ and will not be subject to the new definition. However, as the review process that many are subjected to performs its work, there is reason to fear that this pledge may not be worth much. The second major attack and the one that has not really been widely appreciated, is how much further the Ford system will go in dragooning people into the worst jobs. Their pretence at proving a ‘helping hand’ is quite without credibility. Even their pledge to improve the situation with regard to allowing people to retain a portion of their earned incomes collapses under scrutiny, as the data prepared by Jennefer Laidley from the Income Support Advocacy Centre shows. Given the nature of this government, what should we make of “placing a greater focus on outcomes?” The backgrounder makes clear that “People receiving Ontario Works will complete individual action plans” that will require them to seek low wage employment with sufficient zeal on pain of loss of benefits. The intention is very clearly to intensify the coercive element. “Locally responsive outcome driven service delivery models” will be developed, and “Municipalities will be held accountable for helping people achieve their goals” (provided those goals include working for low pay with no rights and few supports). Perhaps most chillingly of all, the process of “Incentivizing people on Ontario Works to find jobs” will include “Launching a website, Ontario.ca/openforbusiness to make matching job seekers with businesses easier.” The most vile employers will know where to go for a supply of vulnerable workers who must accept employment on their terms or face loss of benefits and outright destitution.